New research from Marcus Autism Center investigators helps to resolve a question about the reduced attention to the eyes in children with autism spectrum disorders: is it because of aversion, or lack of perception of social cues? 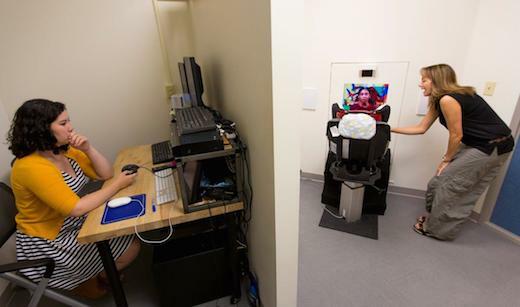 Photo shows how eye-tracking research is performed. A new study conducted by researchers at Marcus Autism Center, Children’s Healthcare of Atlanta, and Emory University School of Medicine helps put to rest a longstanding controversy and question about children with Autism Spectrum Disorder. Eye-tracking measures developed by the group demonstrate that young children with autism do not avoid eye contact on purpose; instead, they miss the significance of social information in others’ eyes. While reduced eye contact is a well-known symptom of autism used in early screeners and diagnostic instruments, why children with autism look less at other people’s eyes has not been known. New research, reported today in The American Journal of Psychiatry, helps answer that question. The new research, conducted on the day when children were first diagnosed, shows that young children with autism do not actively avoid eye contact, and it confirms that other people’s eyes are not aversive to young children with autism. Instead, young children with autism look less at the eyes because they appear to miss the social significance of eye contact. “Studies like this one help advance our understanding of autism and improve the way scientists and clinicians develop new treatments,” said Lisa Gilotty, Chief of the Research Program on Autism Spectrum Disorders at the National Institute of Mental Health, one of the agencies that funded the study. Additional support was given by the Autism Science Foundation, the Marcus Foundation, the Whitehead Foundation, and the Georgia Research Alliance. Jennifer Moriuchi is a graduate student in the Psychology Department at Emory University. Ami Klin, PhD, is director of Marcus Autism Center, Children’s Healthcare of Atlanta, and is Chief of the Division of Autism & Related Disorders in the Department of Pediatrics at Emory University School of Medicine. Warren Jones, PhD, is Director of Research at the Marcus Autism Center and faculty in the Department of Pediatrics at Emory University School of Medicine. The Marcus Autism Center is a not-for-profit organization and an affiliate of Children’s Healthcare of Atlanta that works with than 5,000 children and families affected by autism each year. As one of the largest autism centers in the U.S. and one of three National Institutes of Health Autism Centers of Excellence, Marcus Autism Center offers families access to the latest research, comprehensive evaluations and intensive behavior treatments. With the help of research grants, community support and government funding, Marcus Autism Center aims to maximize the potential of children with autism today and transform the very nature of autism for future generations. Visit marcus.org for more information. Children’s Healthcare of Atlanta has been 100 percent dedicated to kids for more than 100 years. A not-for-profit organization, Children’s is dedicated to making kids better today and healthier tomorrow. Our specialized care helps children get better faster and live healthier lives. Managing more than 920,000 patient visits annually at three hospitals and 27 neighborhood locations, Children’s is the largest healthcare provider for children in Georgia and one of the largest pediatric clinical care providers in the country. Children’s offers access to more than 60 pediatric specialties and programs and is ranked among the top children’s hospitals in the country by U.S. News & World Report. With generous philanthropic and volunteer support since 1915, Children’s has impacted the lives of children in Georgia, the United States and throughout the world. Visit www.choa.org for more information.